FAQ: Why do I need to include an opt-out link & address in my survey invitation? – Checkbox Survey Inc.
FAQ: Why do I need to include an opt-out link & address in my survey invitation? One of the most common questions we receive from customers is "Why is there an Unsubscribe link and mailing address in my survey invitation footer and how do I get rid of it?" The short answer is that this information is required by CAN-SPAM regulations, so we unfortunately can't remove it for you. Continue reading on below to learn more about CAN-SPAM and why it's required. A valid mailing address and an unsubscribe/opt-out link is required for all commercial email, and any reputable organization who handles your email delivery will make sure that your emails contain both those elements. So while we can't remove it, we have recently added the ability for you to style your footer to make the required information more attractive and less obtrusive for your respondents. The sections below on setting and formatting your email footer will help ensure that your invitations contain all necessary information and that they look as attractive as possible. Survey invitations, even B2B invitations, are considered commercial mail and therefore must comply with CAN-SPAM regulations. So, in order to use our invitation service you must ensure that your emails meet CAN-SPAM guidelines. What's the deal with the required Invitation Footer? Since part of CAN-SPAM compliance involves including an opt-out link and a physical mailing address in all commercial mail, Checkbox has made this part easy by merging in a default Unsubscribe link and company mailing address into the invitation footer. The opt out link and mailing address can be edited and formatted (see how to do that below) but they cannot be removed since doing so would violate CAN-SPAM laws. What if I'm not in the US or I promise I'm not sending SPAM? Even if your organization is located outside the US, your email is being delivered by a US service (Checkbox), and we therefore must abide by US CAN-SPAM laws. We know nobody wants the Unsubscribe link in their footer, and even though you may ask really nicely and we may really like you, we still can't break the law by removing it. We have, however, given you some options to format the footer to make it more appealing and less obtrusive to your email recipients (see below). We also offer a Server version of Checkbox, which you can install on your own server infrastructure. Because we don't handle the email delivery for Server customers, we leave it up to them to comply with CAN-SPAM regulations and do not require the same email footer. If you would like more information about our Server version, please email sales@checkbox.com. The required email footer consists of two pieces: the Opt Out or Unsubscribe link and the Physical Mailing Address. Setting the Opt Out or Unsubscribe Link: The Opt Out or Unsubscribe link is already built in and ready to go, so you don't have to do anything to make it work. If you are familiar with HTML, you can edit how the Unsubscribe link displays by editing the HTML of the invitation. Just be sure not to edit the line "href="@@OPT_OUT_PLACEHOLDER__DO_NOT_ERASE" because this will break the link and will cause your invitation not to send. Setting the Mailing Address: The default footer includes fields for Company, Street Address 1 & 2, City, State, Postal Code, and Country. These can be moved around and formatted in the footer but cannot be removed (with the exception of Address 2 and State). 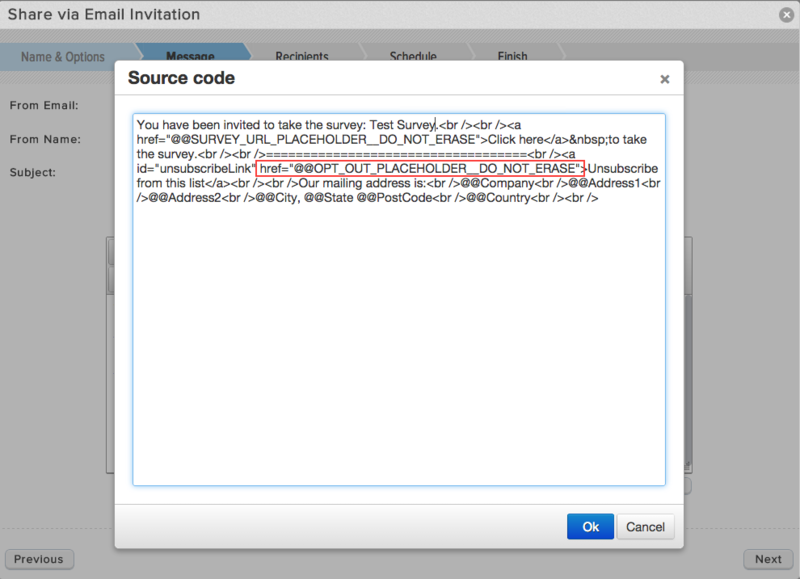 You also cannot edit the @@ merge codes in your invitation footer, or your email won't send. While we've stated that you can't remove the footer or any of its required fields, you can style it to make it more appealing to your respondents. 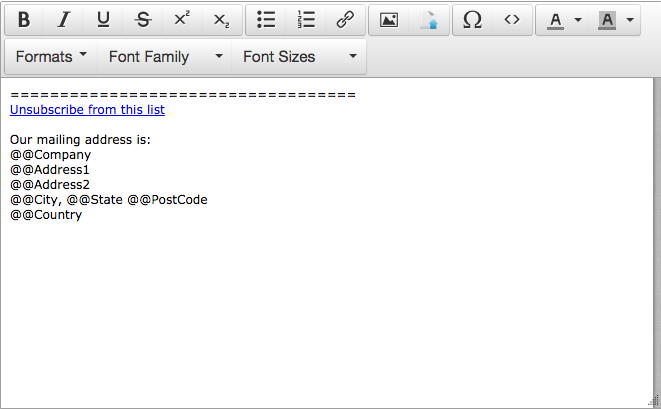 You can use the HTML editor in the Invitation Wizard to change the font, color and size of your footer elements. You can also style the default footer under System Settings -> Email and Invitations -> Footer Settings so that all invitations being sent from your account will have the same footer style.